Apologies for the lack of reviews this last week, I’ve had a lot of work to do (this time designing a freemium game which is very interesting). I had the opportunity to download and play the iPhone version of Stone Age just before it hit the iPhone store. I’m really pleased to say it seems excellent. I’ll write a proper review of it soon but the initial impression is that it’s an exact copy of the board game’s gameplay, plus the implementation is very clever. Fitting everything on a tiny screen is a big challenge in Stone Age as there are lots of different board areas, but this has been achieved very well by displaying the main village areas on one screen and having the resource areas as overlays that slide on- and off- screen very quickly. Also, information about the other players like number of resources and cards held, as well as info on your own position are well handled with info tabs sliding out at a single tap. It’s very slick. Proper review to follow soon. 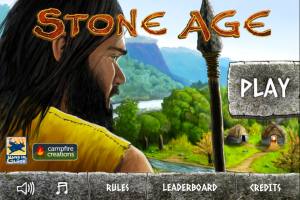 The Stone Age game app for iPhone has been submitted to Apple and should be released in December. It’s been developed by Campfire Creations and, from the screen shots so far, it looks very promising. Stone Age is one of my favourite games (definitely top 10) so I’m looking forwards to seeing how it plays. Their press release says, “Stone Age: The Board Game will include Pass-n-Play multi-player, three AI opponents, and asynchronous or synchronous online multi-player through Game Center” which sounds great.